In honor of the Upper Midwest snowstorm (which I'm very jealous of), I've been thinking of snow related memories. There's several but one jumps out. You should all be thrilled to know this is the first (of presumably many) appearances of Marti, my mother, on this blog. Spring of my junior year of high school (if you want to know what I looked like in high school imagine an 11 year old and you're pretty close) my second sister was studying abroad in Santiago, Chile and my family went to visit her over spring break. Amongst other adventures, I would be responsible for serving as translator for my parents anytime my sister was not around. I was armed with four subpar years of high school Spanish, but that was four subpar year more than Bruce and Marti. Bruce: An infamous legend in foreign languages usually ends up saying offensive things when attempting to to speak. And Marti: A legend in many fields, but with no knowledge of even basic Spanish. After the first night, where I successfully navigated a taxi driver back to our hotel (Derecho vs derecha? That's tough stuff!) I was feeling pretty good about my language skills and the parents were settling in. The next morning at breakfast, I was eating with my parents, enjoying the extremely attentive (and English-speaking) wait-staff. This is one of these places, where your cup could be 7/8th full and they come and top you off and it doesn't matter what you're drinking. Coffee. Tea. Water. Somehow they are carrying all three in three separate pitchers at all times. The picture at the top is from the hotel website, so now you can visualize. 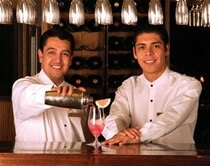 Though it appears that you can see their hands, in reality, those waiters are holding a drink shaker, but also two carafes of Coke (one caffeine free), two plates of fresh fruit, an eggplant, and several miniature Chilean flags. So at this point, my mother leans over and asks me, "Marc, how do you say 'no' in Spanish?" This does not seem to be a plausible question for even the most Espanol-less individual. So my mind changes the question to, "Marc, how do you say 'snow' in Spanish?" Still makes no sense, but I go with it. "Nieve," I respond matter-of-factly and go back to my breakfast. A few minutes go by and eventually a waiter approaches and in flawless English asks, "More tea, ma'am?" Marti holds up her hand near her cup and look at him, confidently declaring, "Nieve." But, shockingly the waiter seems to disregard the fact that a customer just told him, "Snow" when asked about tea and moves on. Meanwhile, I just about choke on my toast, and ask my mother, "What did you just say?" "I said, 'no', nieve. What's wrong?" "You just told him, 'Snow'"
And then, in a claim she still holds to this day, she accused me of intentionally tricking her into looking ridiculous, which, of course, is not true. But, oh yes, I was (and am) amused. Maybe this explains why she didn't let me teach her any words when I was in Asia?